The long-running theme of my relationship with Jen is that she never trusts my culinary judgment. Usually this involves her not thinking my idea is a good one, I do it anyway, and she admits later that it wasn't as bad as she thought. Dare I say she may even say it's quite good! She didn't think sweet and sour rabbit sounded very good. She wanted to have Provencal style rabbit. Yes, for Chinese New Year. She didn't think it was fair to the rabbit to celebrate its year by eating it. I made her to think that I was ignoring her concerns (like I usually do) and opted to make sweet and sour pork instead. I marinated some pork in soy sauce, garlic, ginger, rice wine vinegar, Sichuan pepper, and a little sesame oil. The typical way of doing this would be to drain it, drege it in flour, deep fry it, then cook it in sauce. I didn't really want to deep fry anything so instead I browned it up nicely in a pan then added some vegetables (garlic, ginger, onion, carrots, and peppers) and the ingredients for my sweet and sour sauce: ketchup, rice vinegar, sugar, and honey. I let that simmer for a while before making the rice. I don't generally think of sweet and sour anything as being very authentic. Perhaps it is because I think of this being one of those things I got in Chinese-American restaurants as a kid and it was usually served in a fluorescent red sauce with pineapples and cherries floating in it. While I never tried it I'm pretty sure you could have taken a bowl of that sauce with you into a dark closet and read by the light it cast. 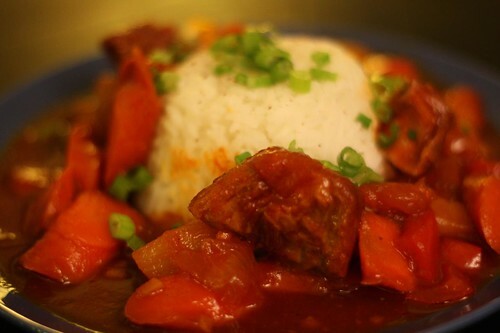 However, this is kind of a traditional Chinese dish, though probably not the way that I made it. I was hoping to find a Chinese beer other than Tsingtao but searching at several different establishments it was all I could find. It's unfortunate seeing that Tsingtao is not that good. It's fine but I always imagine, when having a beer from another country, that it's going to be an interesting and unique experience. Instead, the sensation I get from Tsingtao, is that I'm having a beer from a brewery that rhymes with Schmanheuser-Tush. While I didn't find any other Chinese beers -- I assume there are one or two more -- I did find a few other interesting beers from other Asian countries. However, I decided that if my less-than-authentic interpretation of Chinese sweet and sour pork was not enough of an insult, serving it with Laotian beer would make this meal even more offensive to native Chinese people. TsingTao is a rather delicious beer. But then again you drink ChimaY. Enough said. 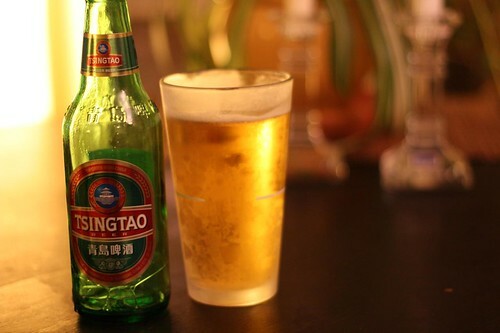 Tsingtao is brewed in the German tradition, since the brewers that began the brand trained in Germany.which is why it tastes somehat familar. I don't understand how someone who claims to like beer can prefer something as essentially tasteless as Tsingtao over Chimay. Not that I mind Tsingtao but it is never my first choice. Jen comes by this trait naturally. Her Mother has never seen an idea that initually was not scoffed at. Unless of course the idea is hers.